Spaceage manufactures simple and most effective lightening arresters incorporating the various findings from different studies. It is an established fact that for lightening arresters has to be effective, the surge produced by lightening should be earthed using a joint less conductor. That's why the copper strip/cable that is brought from the lightening arrester does not have joints. The joints are braised so that a good permanent electrical contact is established. But somehow many people overlook the fact that in some of the lightening arresters in the market, there are three joints. This is true for a typical 5 spike model that has a joint where the spike is screwed into the central dome, which in turn is screwed on to the central rod/pipe, which in turn is screwed to the base. These three joints will kill the effectiveness of the Lightening arrester. Spaceage's arrester is a single rod that has a spike at one end and has an insulation arrangement at the other for mounting. No joints. 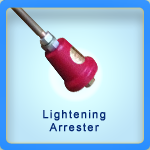 In fact, most of the internationally available lightening arresters also have the same principle. And importantly, Spaceage arrester would typically cost one third as compared to other ineffective models. NOTE: We reserve the right to revise features at any time, without any prior notice. All trademarks and logo are property of their respective owners.